MEDICAL CENTRES (PHYSIO) – NEIGHBOURHOOD RESIDENTIAL ZONE EROSION? Posted on October 31, 2015 | Comments Off on MEDICAL CENTRES (PHYSIO) – NEIGHBOURHOOD RESIDENTIAL ZONE EROSION? At last night’s (4/11) Council Meeting, Councillor’s voted against the Officer’s recommendation to approve the permit application (outlined in the below posting) and opted to reject the application. Councillors recognised that the proposed expansion of the Physio Practice was not supported by Glen Eira’s Planning Scheme (essentially, for reasons outlined in GERA’s below comments). We congratulate the residents opposing this application, for undertaking significant research of the relevant planning scheme clauses and presenting a sound, well-argued case at both the Planning Conference and to Councillors over the recent Melbourne Cup weekend. We also congratulate the Councillors for their willingness to review and accept the residents arguments. Following on from our earlier posting on Medical Centres in the Neighbourhood Residential Zone (NRZ) residents have alerted us to Agenda – Item 9.1 to be discussed at next Wednesday’s (4/11) Council Meeting . The Officer’s Report (Rocky Camera, Manager, Statutory Planning) recommends approval for a proposed expansion of a 2 practitioner Medical Centre (ie. Physiotherapy Practice) to a 5 practitioner Centre (ie. a physiotherapy practice) in a Neighbourhood Residential Zone (NRZ). that Council has appropriate procedures and process in place to ensure that all planning permits are fairly and independently assessed against the Glen Eira Planning Scheme, regardless of the applicant’s, or applicants representative’s, current or past Council associations. However, that being said both GERA and the resident objectors do not believe that the permit complies with the Glen Eira Planning Scheme and are questioning the planning rationale behind the Officer’s recommendation (Officers Report Extract) to approve the permit application. 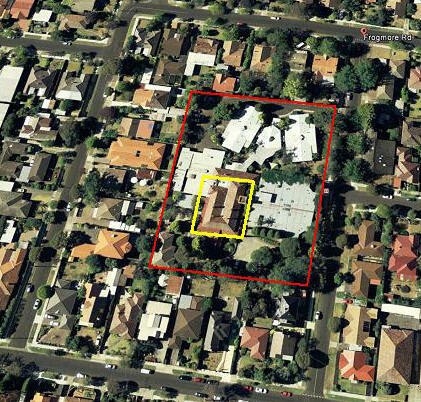 the property is zoned NRZ and is located on corner of Kangaroo Road and Pelling Road in Murrumbeena, close to the Kangaroo and Poath Road intersection and in close proximity to the Hughesdale General Residential Zone and Murrumbeena Park. the property was reportedly acquired sometime after the August 2013, zone implementation and was converted from a residence into a combined residence and physiotherapy practice. While Kangaroo Road is a busy local road it is not designated as a Road Zone (ie. RDZ – a Main or Secondary Road) in the GE Planning Scheme. Pelling Road is quiet residential street of approx. 150 metres. Under the Zones implemented in August, 2013, Medical Centres (ie Physio Practice) are a permitted use (i.e. a planning permit for that use is not required) within the Neighbourhood Residential Zone, provided certain conditions are met. In this instance, one of the conditions contained in the NRZ definition, Clause 32.09-1, is not met, ie. that “The site must adjoin, or have access to, a road in a Road Zone”. Therefore, as Kangaroo Road is not a designated Road Zone a planning permit is required. The permit seeks to expand the Physio Practice from a combined residence and 2 practitioner practice to a non-residential 5 practitioner practice. 13 car spaces for staff and clients, accessed via Pelling Road. In the interests of transparency, at the Planning Conference, resident objectors specifically requested that the Officers Report include a comment to the effect that the 53 letters of support are predominantly template letters that were sought by a close associate of the applicant, from members of a local sporting club sponsored by the Physiotherapy Practice. As such the Objectors felt they raised conflict of interest issues which should be noted. The Officer’s “Reasons for Recommendation” are based on an assessment of the permit application against Council’s Planning Scheme Clauses 32.09 NEIGHBOURHOOD RESIDENTIAL ZONE (Mandatory) and Clause 22.02 “NON-RESIDENTIAL USES IN RESIDENTIAL ZONES POLICY” (Non mandatory or Discretionary). The Non-Residential Uses policy defines “preferred locations” (Clause 22.02=9) as being along “main and secondary roads and on corner sites with vehicular access from service or side road” with this definition being further refined by the inclusion of a performance measure which identifies preferred locations “ as abutting main or secondary roads”. Thus since Kangaroo Road is not defined as a major or secondary road, the permit application does not comply with either the mandatory Zone requirements or the non mandatory Non Residential Uses policy. As previously mentioned the permit application seeks to expand the Physio Practice from a combined residence and 2 practitioner practice to a non residential 5 practitioner practice. This proposed 150% expansion proposal is not in compliance with the Non-Residential Uses Policy (Clause 22.02-5) which supports small scale medical centres in the residential zones by limiting the number of practitioners to two. Despite this significant deviation from the policy, the Officer’s Report recommends permit approval as the deviation is “acceptable as the use is low in intensity”. It is difficult to understand how such a deviation from policy can be considered as both “acceptable” and in line with the overall Non Residents Uses Policy intent of minimising residential amenity impacts. Somewhat of a misnomer, since this section of the Officer’s Report deals solely with parking. on-site car parking requirements the objector’s agree that the required number of spaces has been provided. However, a reliance on tandem parking (Ie. one behind the other) for front staff car park and some rear parking spaces (staff and clients) indicates a likely increase in demand for on-street parking in a small residential road which already experiences high on-street parking demand due to it’s proximity to Murrumbeena Park. Client car parking will be accessed via Pelling Road and will result in increased traffic volume and noise, particularly in Pelling Road, and in Murrumbeena Crescent. No analysis of on-street parking demand or increased traffic volumes arising from the increased number of practitioners is presented. That the residents provided evidence of Physio Therapy Practices in the surrounding area that showed that the area is well serviced by the practices, the majority of which are located in preferred locations. Therefore, lack of existing services (ie. the concept of net community benefit) does not justify the location of clinic of this size in the Neighbourhood Residential Zone (even though that zone is in close proximity to a growth zone). this inadequate consideration potentially has precedent setting implications for future proposed medical centre expansions across the Neighbourhood Residential Zone. Comments Off on MEDICAL CENTRES (PHYSIO) – NEIGHBOURHOOD RESIDENTIAL ZONE EROSION? As more and more properties are being totally or partially cleared of vegetation, the above question is increasingly being asked by residents. Tree Protection is a longstanding issue that residents have consistently flagged as a high priority numerous times over many years and that Council has been working on for just as many years. Yet Glen Eira still lacks both a publicly available Tree Register and a Tree Protection Strategy. Instead Glen Eira relies on Planning Scheme provisions which, without defining “significant”, are only “triggered” when two events coincide, ie. a planning permit is lodged with Council and an inspection of the property identifies “significant” vegetation. To address this obvious issue, the majority of other Victorian Councils enacted (local law) Tree Registers and Tree Protection Strategies years ago, however, Glen Eira is still working on it and in March 2015 voted* to defer this work until an unspecified time. Consequently and sadly, this leads us to suspect that the answer to the above question is that Glen Eira Council, despite residents expressed wishes, doesn’t want either a Tree Register or Tree Protection Strategy. * The vote was a split decision – Crs. Lipshutz, Esakoff, Magee (Mayor), Lobo and Okotel voting for deferral with Crs. Delahunty, Pilling, Sounness and Hyams voting against deferral. Extract from Council Minutes – 17/3/2015. Tree Register is a publicly available list of trees, which includes details of the specimens which have been deemed to be significant. Details usually include species name (botanical and common), tree location, type of location (private or public land), condition and brief statement of significance. Under the Tree Protection Strategy, once designated as significant, or given a “pending review” status, the Tree Protection Strategy and appropriate Planning Scheme Provisions are activated. A tree register is not a static list, it is updated if trees die or require removal and new specimens are identified. Assessment criteria – many and varied. For example the City of Kingston’s criteria considers horticultural value, location or context, rarity or localised distribution, age and potential life span, outstanding size, aesthetic values or curious growth form, outstanding examples of their species, cultural or historical significance. Assessment process – from nomination to determination of significance by a panel of arborists and landscapers. Most Councils have a open to all nomination process, however, past Council Minutes indicate that, since implementation of tree register may create local controversy (neighbour vs. neighbour), Glen Eira Council favours a closed nomination process. Appropriate protection measures to be adopted (reference to Planning Scheme and additional protective measures if, and as, considered appropriate). Availability of tree maintenance advice, provided by Council Arborists, to the custodians (owners) of significant trees on private property. they offer a higher level of protection than the Planning Scheme since permission is required before any action that can damage a classified tree may be undertaken. The protection “trigger” is not restricted to the lodging of a planning permit application on the property where the tree is located. does not preclude arborist site inspections when a planning permit is lodged and the identification of a tree considered worthy of addition to the tree register. additionally, a tree’s inclusion in a publicly available Tree Register will ensure that if the property is to be re-developed, the retention/protection of identified significant tree/s must be taken into account during the preparation of the proposed development’s plans. which as per the Officers Report, involves significant tree identification and protections occurring after the development’s plans have been lodged with Council. It would also strengthen ResCode’s “defacto tree retention control” mentioned in the Officer’s Report. This control requires that any town planning permit assessment must consider any trees removed within the 12 months prior to application lodgement as still existing. Given land-banking and/or the elapsed time between contracting to purchase a property and lodging a permit, it does not provide the same disincentive to totally or partially clear a site that a Tree Register and Strategy provides (ie. how do they know what trees were there, goes beyond 12 months plus 1 day). That while we applaud the comment that “it is estimated that over 200 valued trees are protected each year” we are concerned that number cannot be verified and are questioning the planning zone applicable to the location of the 200+ trees. Resident’s report that few significant trees are identified in the growth zones. While again we applaud the comment “that every approved multi unit dwelling proposal has a permit condition which requires a landscape plan to be submitted and approved by Council. The landscape plan process is an opportunity to ensure the planting of well advanced (between 2m to 3m in height when planted) future canopy trees. The landscape plans are prepared by a suitably qualified person and, importantly, signed off by Council’s landscape architect” we are again concerned about the provision of future canopy trees, particularly in the growth zones. We also have concerns about the enforcement of conditions related to landscaping and the planting of future canopy trees. In the above mentioned instance of a Neerim Road property, soil coverage is minimal and the required 7 (at a minimum of 3.0 metres tall) future canopy tree plantings (4 within the Neerim Road setback and 3 in the South-West Corner) have either not been planted or subsequently died and not been replaced. To aid the growth of future canopy trees, we urge Council to apply the same set back requirements to basement car parks as are applied to above ground building envelope. Burnley College, University of Melbourne. * Dr. Greg Moore was Principal of Burnley College, Melbourne University from 1988 to 2007. Greg has a specific interest in all aspects of arboriculture, which is the scientific study of the cultivation and management of trees. He has contributed to the development of Australian Standards in pruning and amenity tree evaluation and has been a major speaker at Australian and International conferences. He has been a regular on Melbourne radio, particularly with ABC 774 and 3AW and has chaired, since 1996, of the National Trust of Victoria’s Register of Significant Trees. He is currently pursuing active research related to trees and revegetation in the urban environment. Since the August, 2011 Zone Implementation we are receiving and increasing number of requests for information related to Medical Centres in the Neighbourhood Residential Zone – both for new Centres and the expansion of existing Centres. Hence we thought it appropriate to provide our readers with an overview of the relevant Planning Scheme’s Clauses. The gross floor area of all buildings must not exceed 250 square metres. Must be located in an existing building. While this Clause is predominantly applicable to new centres, with regards proposed expansions to existing centres, it provides a guideline of the Clause’s intended objectives re size, intensity of use and location. These intended objectives and the Clause’s Decision Guidelines (a.k.a. factors which may be considered when assessing planning permit applications) should also be taken into account when reviewing planning permit applications for expanded use. 32.09-11 Decision Guidelines – 01/07/2013. Whether the use or development is compatible with residential use. Whether the use generally serves local community needs. The scale and intensity of the use and development. The design, height, setback and appearance of the proposed buildings and works. The provision of car and bicycle parking and associated accessways. Any proposed loading and refuse collection facilities. The safety, efficiency and amenity effects of traffic to be generated by the proposal. The role and function of nearby roads and the ease and safety with which vehicles gain access to the site. The protection and enhancement of the streetscape. The provisions of landscaping for screening and shade. The amenity of the locality and any increased noise or disturbance to dwellings and the amenity of pedestrians. Non residential uses are defined as being a medical centres, places of worship and places of assembly. Residential Areas are defined as being the Residential Growth Zone (RGZ), General Residential Zone GRZ), Neighbourhood Residential Zone (NRZ) and Mixed Use Zone (MUZ). Clause 22.02-2 – Preferred Locations are defined “to encourage the development or extension of non-residential uses in suitable locations which comply with orderly and proper planning principles”. 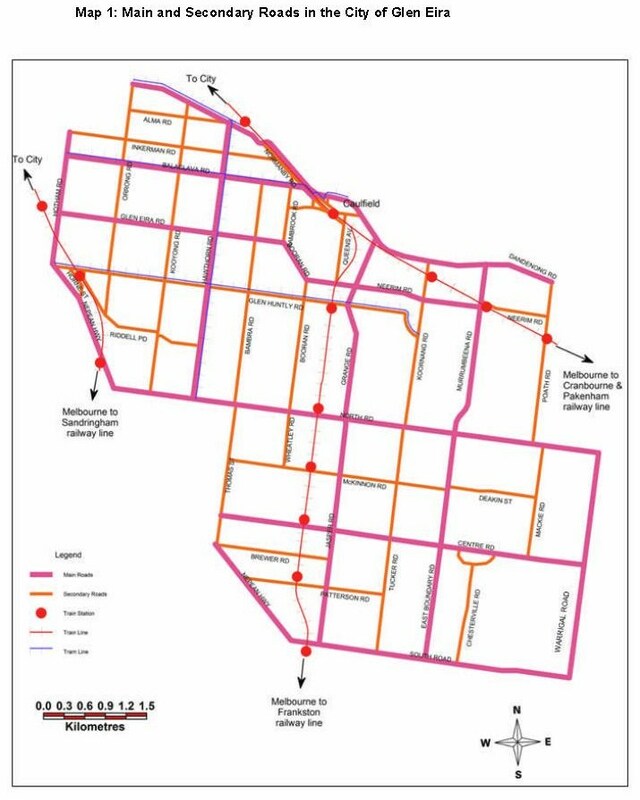 Encourage the location of non-residential uses in “preferred locations” including main and secondary roads and on corner sites with vehicular access from service or side road”. Please note that under the heading performance measures, preferred locations are “identified as abutting main or secondary roads”. Consider other locations where it can be demonstrated that residential amenity will not be unreasonably compromised. These Clauses are primarily related to the building envelope, set backs and landscaping of street interfaces. As such they are best discussed when accompanied by a planning permit application. Ensure the intensity of the use, in terms of staff levels, numbers of people providing health services, patron numbers and hours of operation are appropriate to the site layout, locality and does not unreasonably impact the amenity of the neighbouring properties. Promote small scale uses (no more than 2 people providing health services) to operate in the existing dwellings, in order to maintain the residential appearance and nature of the locality. Minimize any visual and acoustic privacy impacts to neighbouring properties. The Performance Measures (a.k.a. Decision Guidelines) include bench marks for operating hours, screening treatments for overlooking adjoining properties and acoustic treatments and screening required for noise abatement. The Performance Measures (a.k.a. Decision Guidelines) include signage dimensions, heights and location. The below listing includes Clauses that are also relevant to Non Residential uses in Residential Areas, however, some content of these may also be included in the review of the above Clauses. To ensure that non-residential uses are successfully integrated into residential zones with minimum impact and minimum loss of residential amenity. To ensure community awareness and input into the long term expansion plans of large institutions in residential areas. To ensure a greater diversity of housing to meet future housing needs. To improve and protect the livability, neighbourhood character and amenity of Glen Eira. To promote environmental, social and economic sustainability. To stimulate and improve the vitality of Glen Eira’s commercial centres. To improve access to housing for residents with special housing needs. To ensure integrated neighbourhood planning of Glen Eira’s suburbs. Part of the Municipal Strategic Statement that although including some aged components (eg. Key Land Use Vision – 19/01/2006), provides a broad overview of the Glen Eira’s Planning Framework. 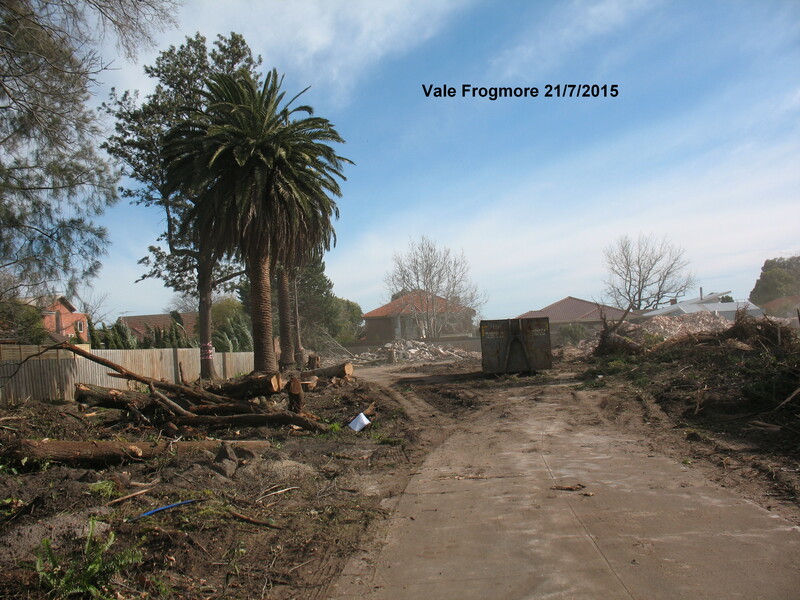 Many readers will remember GERA’s unsuccessful “ Save Frogmore Campaign” (1 Wahgoo Road, Carnegie) and Glen Eira Council’s shameful 9/6/2015 decision to abandon applying heritage protection to Frogmore House before it could be assessed by an Independent Planning Panel (effectively denying all stakeholders access to the appropriate due planning scheme amendment process). The end result being the demolition of Frogmore House occurring in July, 2015. Unfortunately, it appears that an addendum has recently been added to the shameful Frogmore Saga. This time it is related to processing the of the planning permit application for a two storey Aged Care Facility which includes a proposal to remove 88 trees from the site. a Council commissioned Independent Heritage Expert Assessment (Jan, 2015), which unequivocally recommended Heritage Protection at the Municipal Level. it being inconsistent with the Glen Eira Municipal Strategic Statement, Glen Eira Planning Scheme and the 1987 Planning and Environment Act objectives of planning for Victoria. Inadequate strategic justification was provided to support this inconsistency. an unsubstantiated determination of Net Community Benefit of 120 beds. With 120 beds equating Jewish Care’s assessment of site potential if Frogmore wasn’t retained. Clearly, this net community benefit calculation ascribes a zero value to heritage. “Frogmore is significant to the locality of Carnegie and Murrumbeena and City of Glen Eira and should be conserved as one of the cultural assets of the city … Frogmore House should be included in the schedule to heritage over lay clause 43.01 by the Glen Eira Planning Scheme”. 17/6/2015 Planning Permit Application for a 2 storey Aged Care Facility at 1 Wahgoo Road, Carnegie, lodged with Council for Council review. 15/9/2015 Advertising period for Planning Permit Application commenced, ie. plans made available for residents review and possible objections. 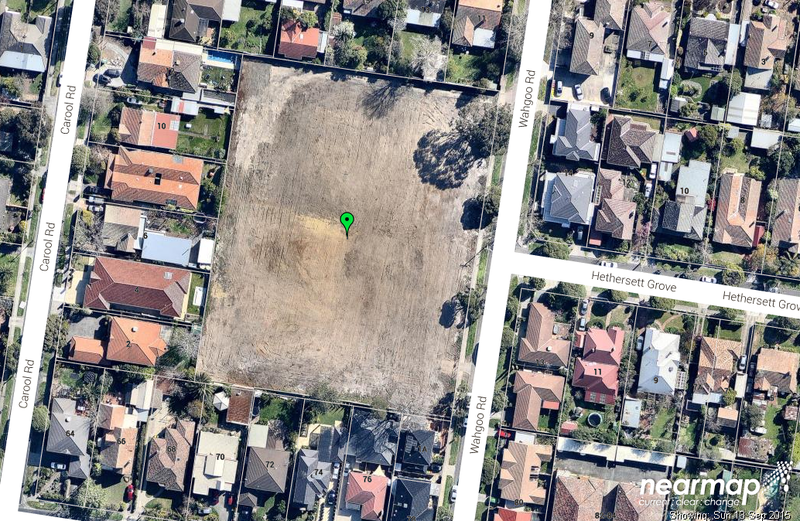 Included in the permit documentation provided for residents review is a proposal for the removal of 88 trees – we’d appreciate readers assistance in finding them in the above 13/9/2015 aerial photograph. To aid you below is a aerial picture of the site circa January, 2015. 29/9/2015 Advertising period completed. Objections received to be considered by Council in near future.